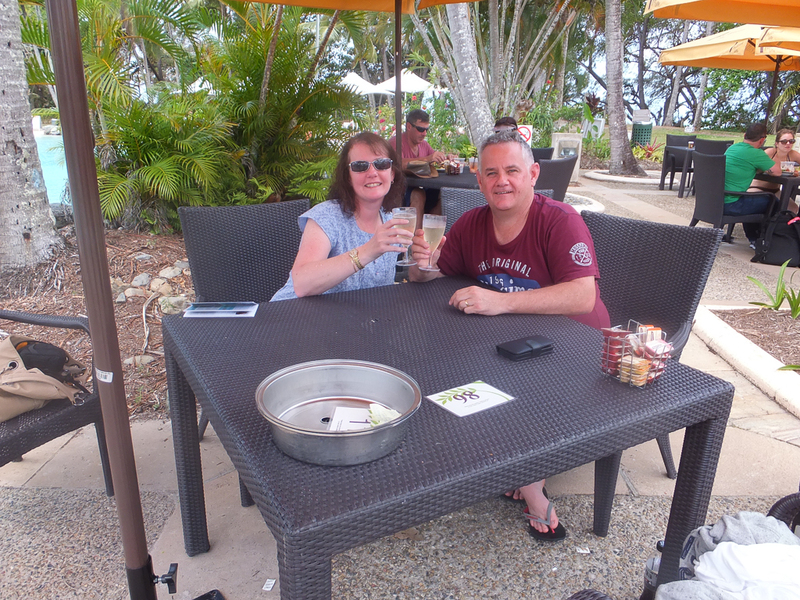 In November 2013, Craig & I celebrated our 10th wedding anniversary with 5 childfree days in Port Douglas, Queensland. Neither of Craig or myself had been to North Queensland before so we were both looking forward to a new adventure. Nan arrived bright & early & we kissed the little monkeys good bye & headed off to the airport fully of anticipation & excitement. Our flight was early, I held back the temptation of having a champagne on the plane as it was 9am!. Its a 3 hour flight from Melbourne to Cairns, our transfers, from Cairns to Port Douglas took 1 hour. The weather was glorious, lovely & warm, a breath of fresh air from the extended winter we were experiencing in Melbourne. I expected it to be really muggy & some days were worse than other but overall it wasn’t that bad. Humidity doesn’t bother me, Craig struggles with it more than I do. We arrived at the Sheraton Mirage at 1pm & we were advised our room would not be ready until 2pm. This wasn’t an issue & we headed to the pool & bar for that glass of champagne I had been so looking forward to. Its 5 o’clock somewhere in the world so ok for me to have a champers!! I used the gym to change out of my Melbourne attire & into my togs. Our room was taking a while to prepare so we had some lunch & went for a dip. This is the first time I have stayed somewhere with a swim up bar (it was one of the stipulations I had when deciding on a location!). The fact that the room wasn’t ready was no issue for me, I was happy in the pool! At 3pm our room was ready, we got a lovely upgrade, think it might have been because we were waiting so long! Our room was on the ground floor & our balcony opened on to the lagoon. It really was a beautiful place to wake up to & look out the window to the lovely turquoise water & the warm tropical weather. Our room had plenty of room, more than enough for the 2 of us! Our ensuite had a spa with a shower over the top. The spent the rest of the first night exploring the resort & had a light dinner on the balcony & a bottle of complimentary champagne! ← Sepilok Orangutan Rehabilitation Centre on the cheap!